Magnaflux demagnetization units remove any residual magnetism remaining after conducting Magnetic Particle Inspection. Demagnetization of ferromagnetic parts and materials often requires a requisite to final finishing or to ready an item for its ultimate use. 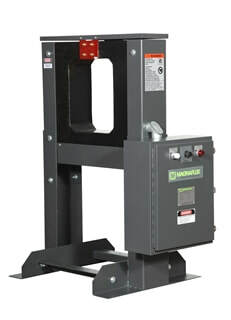 Industrial demagnetizing is not an easy task, unless an effective demagnetizing system is used. It is especially difficult when the magnetic field must be reduced to a very low level. Compact in size and ruggedly built, Magnaflux demagnetizing equipment offers a fast and efficient method for demagnetizing a broad variety of part types and sizes.